Thunder Bay and purchase their first Tim Hortons store on Waterloo Street about 10 years ago. “ When we moved here my wife was seven months pregnant. Today we both work in the business as we are on call 24/ 7 and have two young kids. We are in the Tim's family now.” said Brent Prepp. 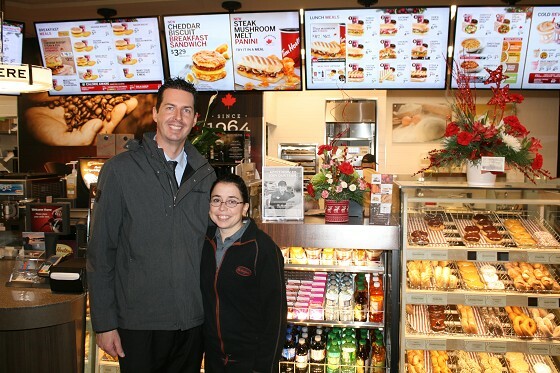 The couple now own Tim Hortons restaurants on Waterloo, Sibley Drive near Montana’s, Oliver Road and now the brand new Edward Street location. and have been fantastic to work with says Brent Prepp. There are about 4000 Tim Hortons units or more in Canada. 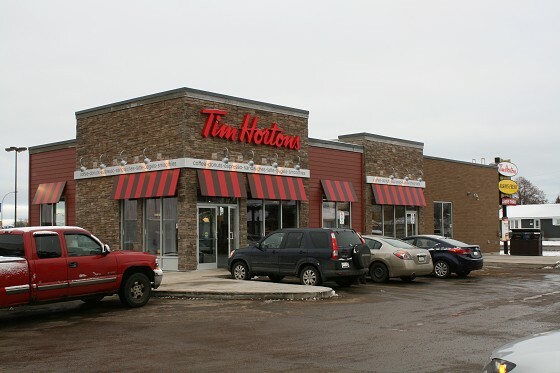 In Thunder Bay there are 12 main free standing Tim Hortons units owned by three groups. This Edward Street store is their newest concept. important part of any business and you have to keep your staff happy for sure. We want to create a great working environment and have the staff stick around. We have some staff that have been with us for 10 years now. It is unheard of in the food industry but it all comes down to treating them well as we get the same respect back from them.” said Brent. Brent and Jennie don’t take a day off and everyday are at a store or their office. They took their first vacation after 5 years where they went somewhere not for business. Today they have a good supervisory management crew, a good foundation now.